Rugby Fives is one of four variants of the increasingly popular game of handball, where the only equipment needed is a ball & a pair of gloves, both available from reception and from members of the YMCA Rugby Fives Club. As it is played with both hands rather than with forehands and backhands, it is one of the few games that exercises the whole body and is an excellent all round body conditioning game, that helps improve left handed coordination, hand/eye coordination and both side foot movement. It is played as either Singles or Doubles and here at the Y Club we have the only specialist courts in the Greater Manchester and wider area. The National Singles championship is played here once every four years with other regular tournaments throughout the year. Beginners are welcomed, and there are handicap events so that beginners can mix in with the regular players. Tuition is available from members of the club, including Wayne Enstone, one of the YMCA’s sporting hero’s, three times World Singles & Doubles Champion and 23 time British Open winner. The YMCA Rugby Fives Club broke the dominance of public schools in the game nationally, and has been instrumental in helping ordinary schools like Derby Moor and others develop new young keen players. The Club’s Fives Team has won the National Club Championship more times than any other club in the country, winning 5 times in a row, not once but twice! The game prides itself on sportsmanship and manners, and is highly tactical so the rules are clear but there are no referees, and amazingly, very few arguments. Come down and give it a go. The club has a highly social group of players who organise internal tournaments and social events throughout the year. 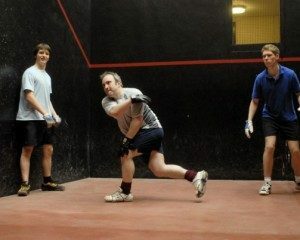 For more information on the game visit the Rugby Fives Association website.